As expected, blue chip counters recorded gains pushing the Milanka Price Index (MPI) up on Thursday the 31 March 2011. However, the momentum may slow down with the end of financial year according to brokers. Illiquid small and mid cap counters might get attention with the end of the deadline to reduce credit at broking houses. The All Share Price Index (ASPI) closed at 7,226.12 points, rose 0.46% by 33.40 points and the Milanka Price Index (MPI) increased 0.92% by 62.96 points closing at 6,874.74 points during the day. A total volume of 62.08 million shares changed hands topped 74.37% with a total turnover at Rs.2.19 billion (rose (85.5%). Foreign purchases increased 495.21% to Rs.793.71 million and foreign sales dipped 55.34% to Rs.101.31 million. Price to forward Earnings Ratio (PER) rose 0.39% to 25.7 times. 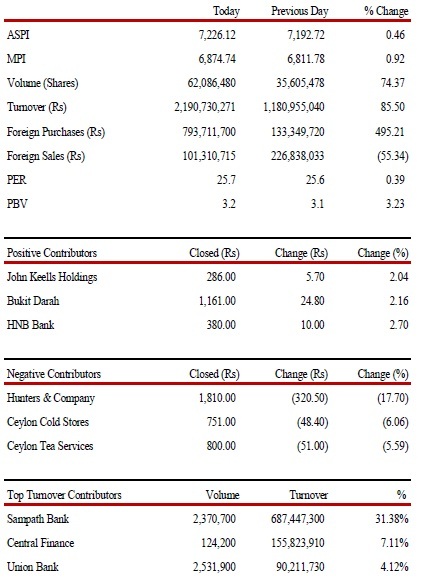 Another crossing of Richard Pieris (RICH) was done amounting to 2 ,170,700 shares at Rs.13.50 per share. Bank, Finance & Insurance sector was the main contributor to the market turnover due to Sampath Bank (SAMP), Central Finance (CFIN), Union Bank (UBC) and HDFC Bank (HDFC) with the sector index increasing 1.21%. 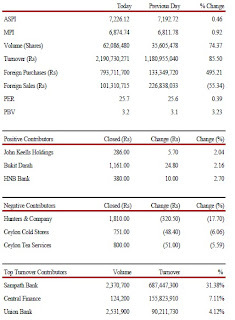 Sampath Bank (SAMP) was the main contributor to the market turnover with five crossings 2.14 million shares at Rs.290 per share and the share price increased by Rs.2.10 (0.73%) and closed at Rs.287. Foreign holding of the company increased by 2,302,000 shares. Diversified sector also contributed to the market turnover due to John Keells Holdings (JKH), with the sector index increasing 0.74%. Profit taking was witnessed in Ceylon Cold Stores (CCS) to a certain extent after making substantial gains over the last couple of days. Overseas Realty (OSEA) announced a final dividend of Rs.0.30 per share.